... Henry Koch (*1960) sees the music in his piece Sonvexxon – Erosion 5 permanently in motion, without however adhering to any strict laws. "Lenses, prisms and distorting mirrors" reflect and diffract light in manifold ways, until it finally generates a flood "that rises quickly and thickens to a pandemonium, then subsides, releasing the final chord it contains, in which a perfect harmony may lie hidden – the overtone series, part of it at least, if only for a brief instant." (Henry Koch) Olga Neuwirth's (*1968) composition Photophorus was inspired by the firefly species of the same name: "The sounds in Photophorus change in shorter and longer waves; even radically assembled cuts are set in the context of processes that govern the entire sound material. A multitude of individual events add up to complex overlaps; the collective result is the glimmering focus of attention." 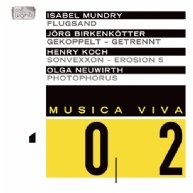 (Bernhard Günther) The use of electric guitars in the orchestra adds another intriguing hue. In 1951, after numerous solo compositions, Cage tried his hand at a piano concerto, naturally for the prepared variety. And in marked contrast to the concerto: Sixty-Eight. All three of Bartók’s piano concertos performed in one go: a nightmare for the average piano player, and a real challenge even for master pianists.